(Nanowerk News) On a quest to design an alternative to the two complex approaches currently used to produce electrons within microwave electron guns, a team of researchers from Euclid TechLabs and Argonne National Laboratory's Center for Nanoscale Materials have demonstrated a plug-and-play solution capable of operating in this high-electric-field environment with a high-quality electron beam. Unfamiliar with microwave electron guns? Perhaps best known within the realm of X-ray sources, microwave electron guns provide a higher current and much higher quality electron beams than conventional DC guns. Beams of this sort are also used in free-electron lasers, synchrotrons, linear colliders and wakefield accelerator schemes. But the electron emission mechanisms involved -- laser irradiation of materials (photocathodes) and heating of materials (thermionic cathodes) -- tend to be complex, bulky or extremely expensive. To simplify the process, as the team describes in Applied Physics Letters ("Planar ultrananocrystalline diamond field emitter in accelerator radio frequency electron injector: Performance metrics"), they turned to a third electron emission mechanism -- field emission -- to create a plug-and-play solution based on ultrananocrystalline diamond (UNCD) originally introduced at Argonne. 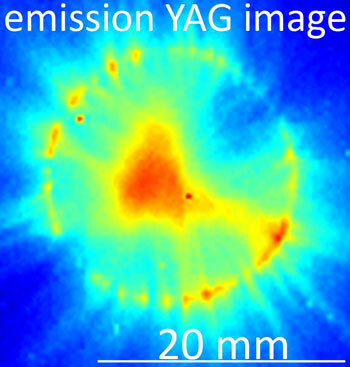 An image of the electron beam produced on an Yttrium-Aluminum-Garnet (YAG) phosphor screen. Field emission "is a process of liberating electrons from solid-state materials into a vacuum by the electric field," said Sergey Baryshev, a material scientist, and Sergey Antipov, an accelerator physicist, working for Euclid TechLabs. "A strong electric field on the surface induces tunneling propagation through the surface barrier. So, essentially, our field-emission cathode (FEC) is an electron source alternative to photo or thermionic cathodes, which use an intense laser or high temperatures to liberate electrons," added Antipov. At Argonne's Center for Nanoscale Materials, field emission properties of UNCD have been studied for several years, and researchers were able to demonstrate that UNCD performs better even in planar configurations, unlike other diamond films, which need to be shaped into high aspect ratio structures to locally enhance electric field and produce significant currents. "This is due to the unique carbon bonding configuration within the few-atoms-wide grain boundaries surrounded by nano-sized UNCD grains, which yield very high field enhancement naturally," noted Ani Sumant, a nanoscientist and UNCD specialist at Argonne. The team's study is the first known actual testing of a planar thin UNCD film in an electron injector, in which UNCD film virtually replaces a part of an inner copper wall subject to the strong oscillating electric field. One surprise was discovering that "UNCD provides such a large charge and peak current with such low angle divergence and energy spread of the electron beam -- both of which are comparable with photocathodes," Baryshev said. "The produced electron beam is of very high quality." Importantly, UNCD survived under harsh conditions in the microwave gun without noticeable degradation for an extended period of time. "The planar geometry of UNCD may help distribute the total electric field experienced by narrow grain boundaries—more than a trillion per square centimeter," explained Sumant. While the UNCD FEC may one day become a true commodity electron source for conventional copper-based accelerators, the team expects to see the most interesting implications within the field of superconducting radio frequency (SRF) accelerators. "SRF systems potentially offer higher duty cycles, which equate to higher production rates, which is important for industry," said Chunguang Jing, vice president of Euclid TechLabs. "Until now, though, SRF systems weren't considered attractive by industry because their wall-plug efficiency is low and, compared to conventional systems, mainly caused by using warm electron injectors with photocathodes (lasers) or thermionic (heaters) cathodes." An accelerator is a complex system, and on a very basic level it's analogous to the microwave oven or kettle in your kitchen, so you can determine its wall-plug efficiency -- essentially how much consumed electricity was actually used vs. wasted. "For SRF and conventional copper systems to produce an electron beam, this parameter is 10 percent. Its consumed energy will be 10 times greater, because 90 percent of it is wasted," noted Baryshev. "It was previously demonstrated that if SRF were fully cryogenic under liquid helium temperatures, wall-plug efficiency could be boosted to 50 to 60 percent. Our UNCD FEC may enable this option by avoiding any warm parts within an SRF system." Why is all of this so significant? One compelling reason is that fully cryogenic high-efficiency SRF accelerators can quickly translate into huge electricity cost savings -- on the order of millions of dollars per year -- compared to electron accelerator facilities using conventional accelerators. The team's technology is relevant to "many existing industrial and medical challenges -- including those of the highest national importance," Baryshev added.